"My love of riverbeds and pebble pools originates from my childhood on my family's farm in Quebec. Observing the infinite shapes and colors of the pebbles under the moving, shimmering water fascinated me. During my return to the east coast, I again fell in love, this time with Vermont's waterfalls and riverbeds. 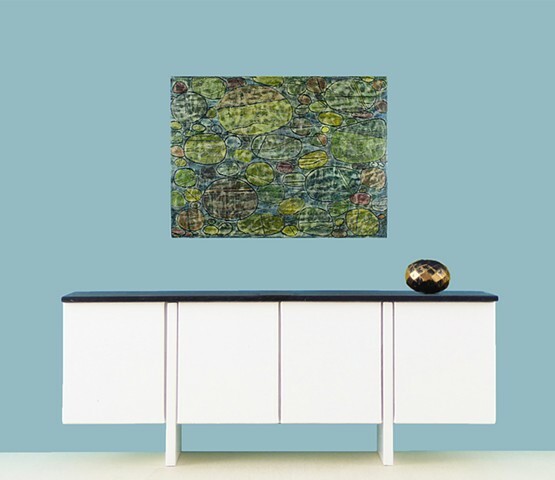 I now try to recreate the reflections on the water, the colliding movement of the pebbles and rocks under the currents in these abstract paintings." The method for each painting is first created, with a vinyl paste applied over a 3/4" depth wood panel. The surface is then hand craved and sanded. Acrylic paints and mixed mediums are used for desired effects. The painting is then sealed with several layers of satin Polyacrylic protective finish. 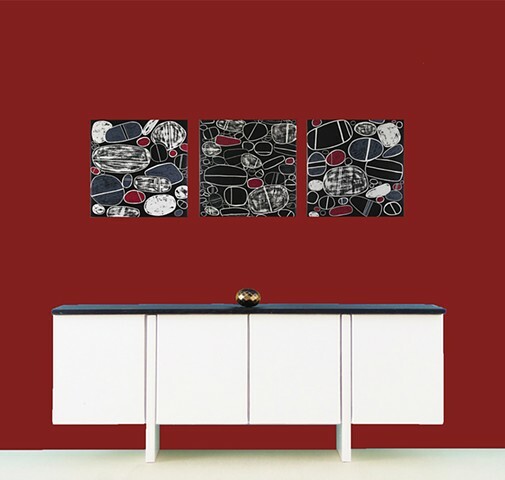 The original paintings available here on the website are shown accurately in size over a 4 foot modern white crededenza.